The first team to make this official was the Chicago Cubs. In 1913, they would utilize this simple grandstand and makeshift baseball park / race track. The Cubs during this period weren’t one of the better teams in the league but they did feature Hippo Vaughn. The man with the funny name would be one of the terrors on the mound in the National League, as he was would break the 20 win mark 5 times in his career and have ERA’s that droped down as low as the mid 1.70’s. We’re not really sure why he wasn’t considered for the Hall of Fame. The Cubs would spend 4 seasons here at Plant Field before moving on to Pasadena California in 1917. 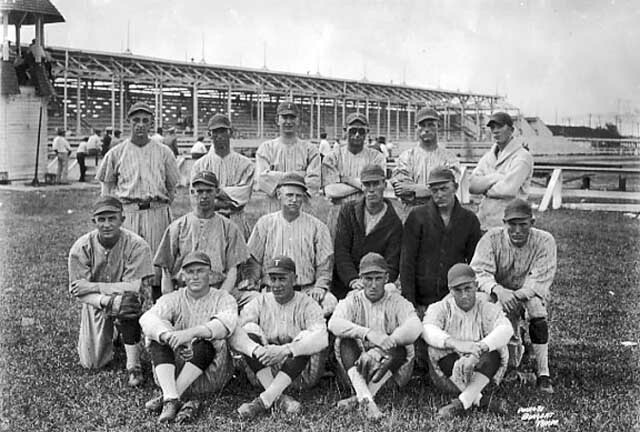 After a year without Spring Training, the Boston Red Sox would come to Tampa in 1919 leaving their Majestic Park in Hot Spring Arkansas where they had been training for 9 of the previous 10 seasons. The Red Sox were here for only one year but they would make this place one of the most historical points in Tampa. It was all because of their hot shot young pitcher who swung an even hotter bat. When the Red Sox came to Plant Field in 1919, they were coming off a World Series Championship. They had 5 pitchers in their rotation including one who splitting time between the mound and the outfield. Babe Ruth had posted a 13-7, 2.22 record in 19 starts. In the previous season, Babe Ruth had won 24 games but this time he was held to only 19 starts. The reason why is because he hit 11 Home Runs. Now keep in mind that was 10 more than anyone else on the team had... so despite being a 24 game winner, Ruth’s starts were kept to a minimum so he could get more At Bats.